When you are looking into building a swimming pool for your backyard, you want to hire someone who can take your design ideas and vision for the swimming pool and help make them a reality. You do not want a cookie cutter swimming pool that looks like everyone else’s. You want a pool that has a beautiful and unique design that will really set your pool apart. A big part of pool construction includes the design process. This process will help make sure you are satisfied with the end result. 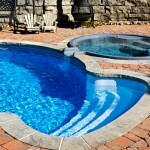 When you are beginning pool construction, it is important that you look into all different options. You need to know what shape of pool will fit onto your property. You also want to think about design schemes. If you are not sure what you are looking for, your pool contractor will be able to show you different examples that will showcase all the different options available to you. For example, they will show you the different types of tile that can be used and all the different options for materials surrounding the pool like concrete, tile, stamped concrete, or stone. You will also need to know if you want a diving board, a slide, water features, a walk-in entrance, a shallow end, a deep end, or stairs. Once you make these decisions, then you can move through the design process to the actual pool construction. You will be able to see your vision unfold before your eyes. If you are interested in learning more about pool construction, contact us today at Lake Norman Signature Pools & Patios. We can answer all of your questions and help you make informed decisions. Our professional pool design and installation teams can help you turn your backyard into a beautiful and luxurious space that you and your family can enjoy for many years to come.